Combine all ingredients in blender and blend until smooth. Garnish with mint and serve with a straw that has not been licked by a toddler. It is officially summer, and in our neck of the woods that means temps of 110+, so this episode is all about summer eating and cooking! Life has changed pretty dramatically for both of us, so have our meal planning/grocery shopping routines, so we're dishing about the eaters in our households now, how we plan to feed them, and what a typical day of meals looks like for us. 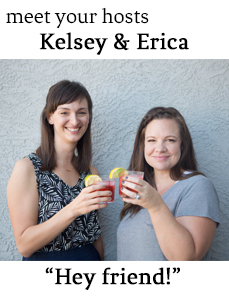 We also share our summer cravings, go-to summer meals, and recipes we want to try over the next couple of very hot months. Speaking of hot weather treats, Erica is currently obsessed with making healthy popsicles for the girls with these Tovolo Rocket Pop Molds. Kelsey is obsessed with paint colors for a big interior house painting project. In neighborhood news, there is some trash across the street, and that one house is still salmon.